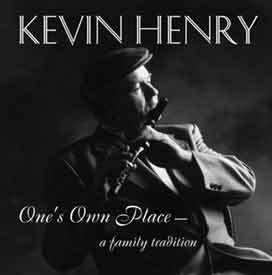 One's Own Place contains 23 tracks of Irish traditional music and recitations from Kevin Henry, who plays flute, tin whistle and uilleann pipes. Kevin hails from the Sligo/Mayo border region better known as the famous Coleman Country area of Ireland. He is joined on several tracks by his daughter Maggie Healy, flute, tin whistle, fiddle; sister Verona Ryan, fiddle; brother Johnny Henry, fiddle and life-long friend on bodhran, Malachy Towey. Kevin Henry is a master storyteller who performs what are known in Ireland as recitations. Here he performs Guilty or Not Guilty, The Hellbound Train, Rex, Peg Kelley's Black Cat and The Green Eye of the Little Yellow God. Don Meade, The Irish Voice "Many's the good album is praised as a drop of the pure stuff. This is more like a full bottle." Click here to order online at CD Baby. Click here to order online from CD Baby.